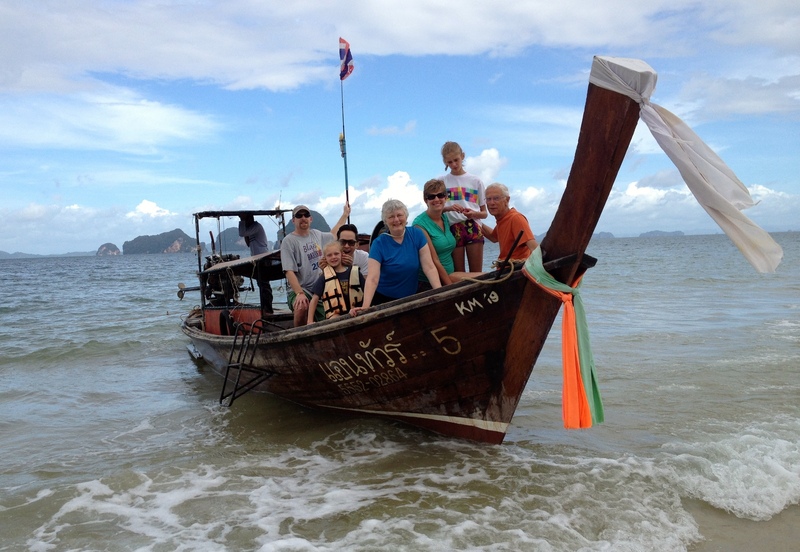 The second half of my family’s trip to Thailand was spent in the south, in the Andaman coastal province of Krabi. 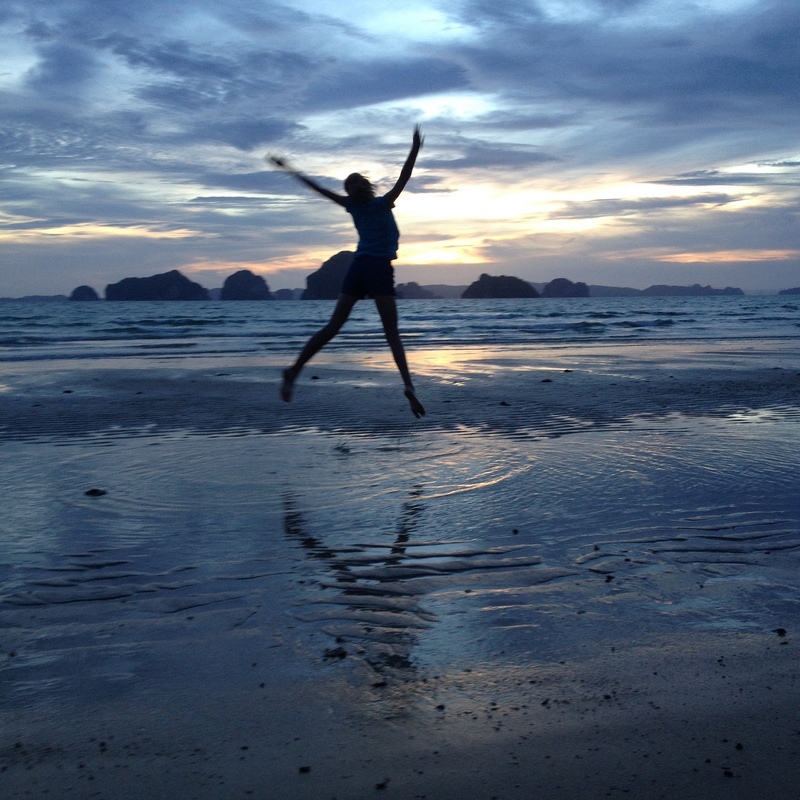 For midwesterners, a trip to the beach is a highlight of any trip to Thailand. 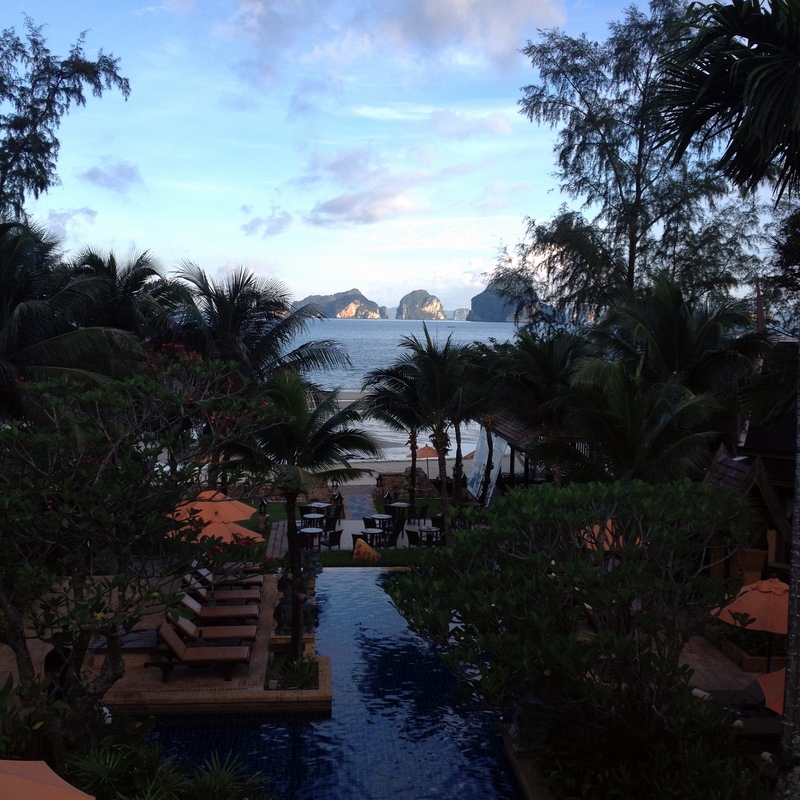 Amber waves of grain don’t have anything on the warm tropical waters in Thailand. 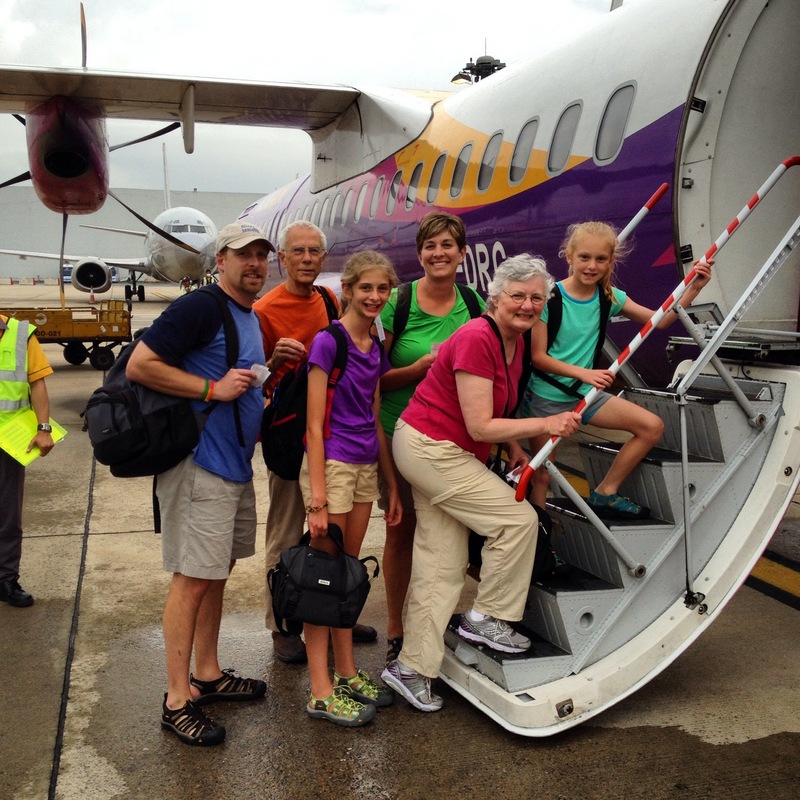 For the one-hour flight to Krabi, we once again flew Nok Air (“Bird” Air) which was a big hit with the girls. The planes are painted like birds, which they thought was pretty cool. 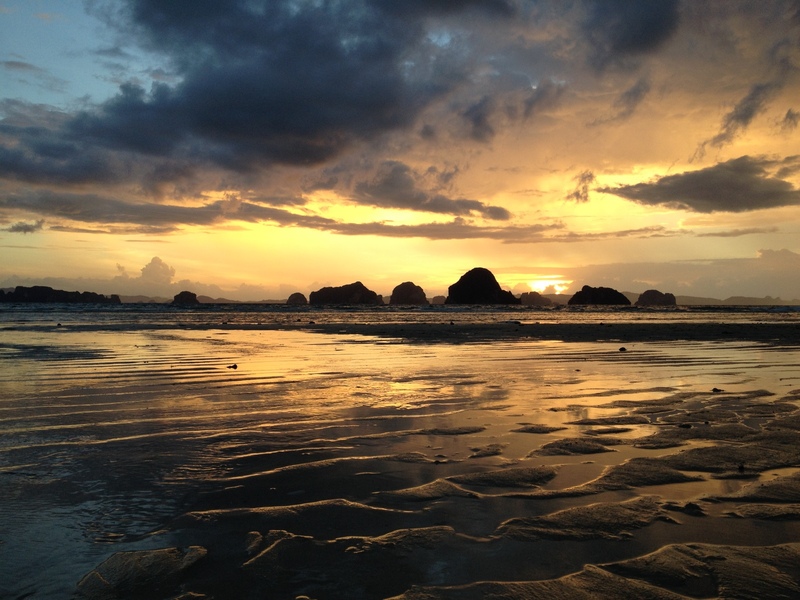 We stayed at a resort right on the beach, giving us a spectacular sunset view every evening. The resort is small – only about 50 rooms – and quite out of the way. While this limited the ease of travel elsewhere in the province, the two pools and the beach provided enough attractions. 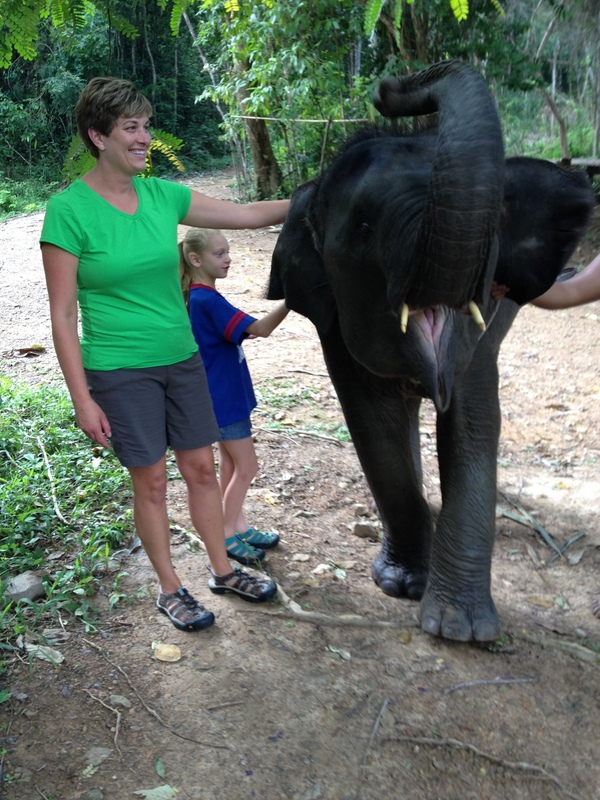 We did sneak out one day for an elephant ride – here, my sister and youngest niece pet a baby elephant – and a visit to a spectacular crystal clear natural spring in which you can swim. While out, we had a chance to stop in the main town for authentic southern Thai food – Hat Yai style fried chicken, a steamed fish mousse, and “Chinese style” rice noodles with curry sauce and fermented vegetables. I’m glad that everyone gave the food a try and for the most part, seemed to like it. Well, the fried chicken at least. 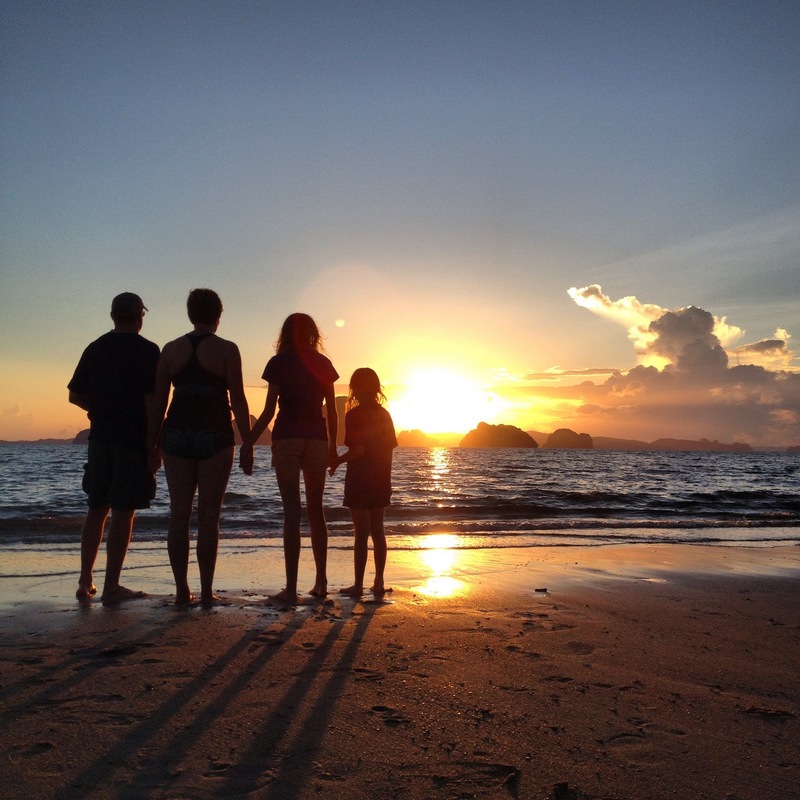 Every day at sunset we were on the beach. 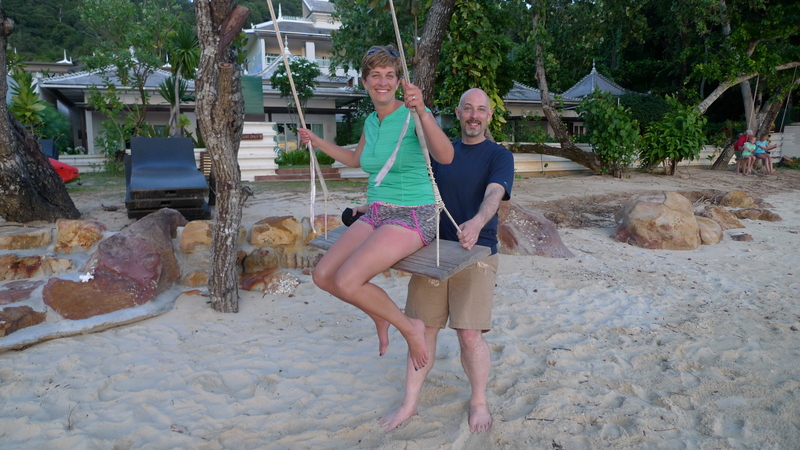 Here, recreating some picture from a childhood, I give my sister a push on a swing. One of my nieces also provided the gymnastic antics to create this beautiful picture. Our last full day there, we hired a long-tail boat to take us to a pair of islands about 10 kilometers off the coast. The nieces weren’t too happy about the boat ride but the rest of us enjoyed the experience. One nearly-deserted island had an interesting isthmus that largely disappeared at high tide but provided a comfortable spot to enjoy the breeze and take in the views of the steep limestone cliffs. At a second island, we cruised into a lagoon in the middle of the island that is only accessible during high tide. The water was less than three feet deep and the cliffs surrounded the lagoon on all sides except for a narrow opening to the sea. 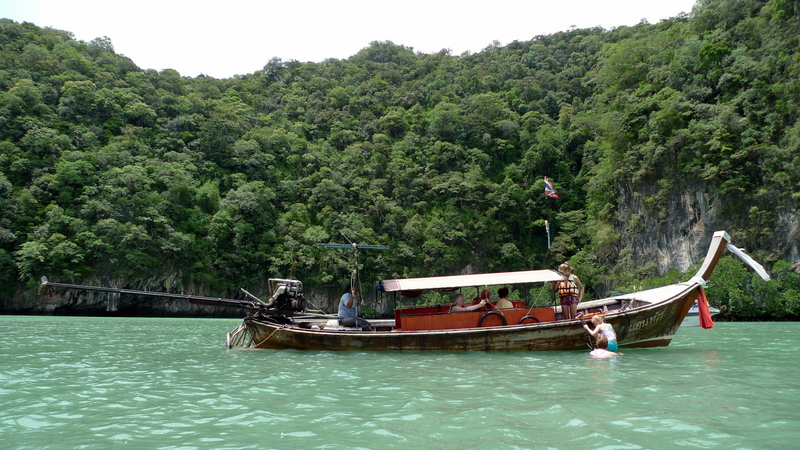 Finally, we docked at the other side of the same island (called Koh Hong) where there is a large protected beach. It is part of a national park on employees keep a careful eye on visitors to ensure there is no littering. While the waters were a bit cloudy because of the monsoon season, we did a little snorkeling near the large rock and were able to see quite a few schools of fish. All in all, I think it was a very enjoyable four days for everyone and a good final experience for Thailand. I’m glad we saved the beach for the end of the trip. My parents, sister, brother-in-law, and their two girls are visiting for two weeks. 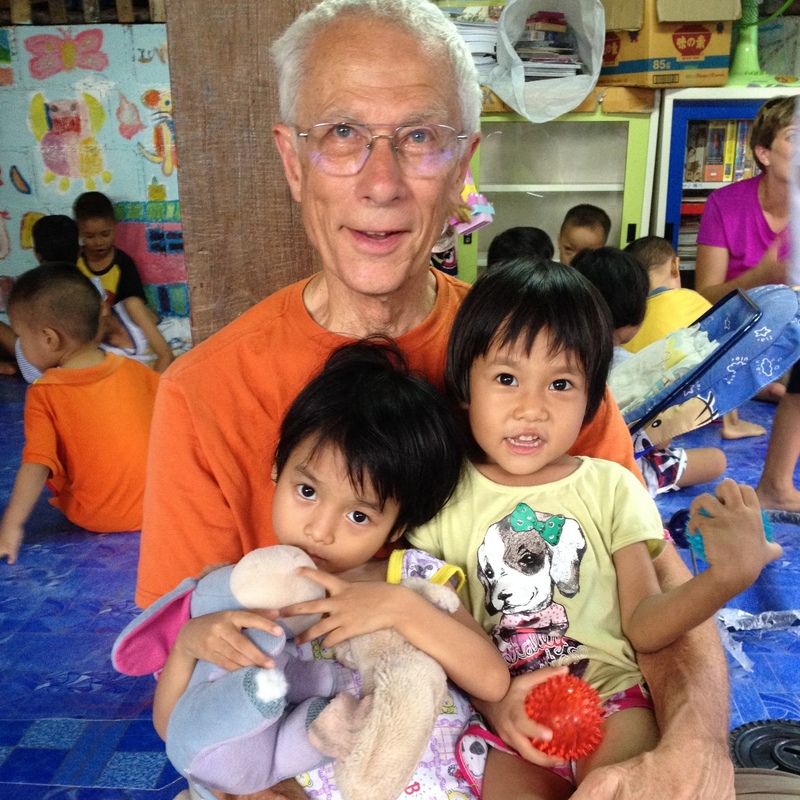 During the first part of the trip, we flew to Mae Sot, a town on the border with Myanmar, to visit an orphanage and other related facilities at which I’ve volunteered before. Here’s a look in pictures at our visit there. 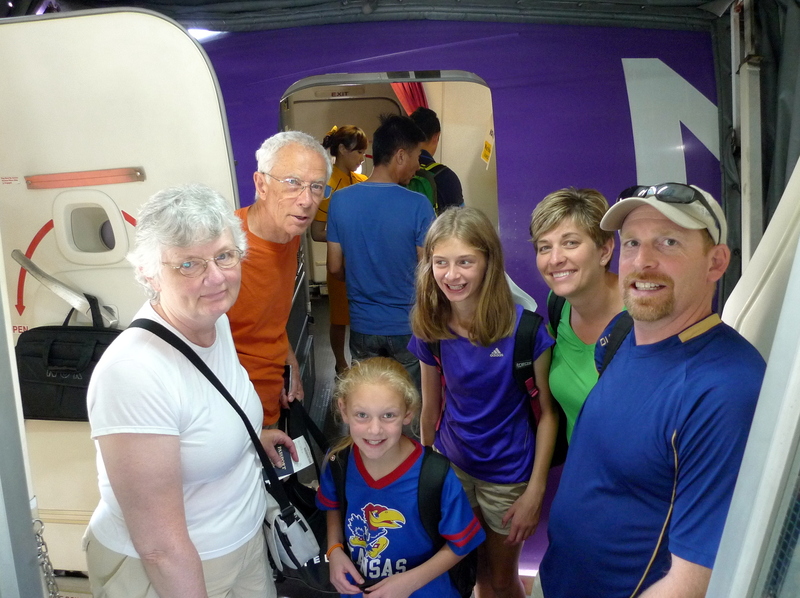 Boarding our Nok Air flight out of Don Meuang Airport in Bangkok, arriving in Mae Sot one hour later. 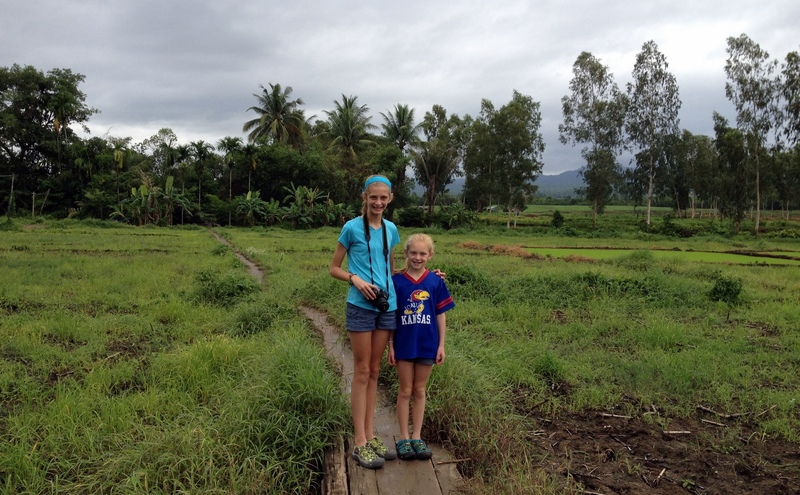 As we touched down in Mae Sot, the ground was dry. By the time we reached the end of the runway and taxied back to the terminal, a torrential rain shower had unleashed. 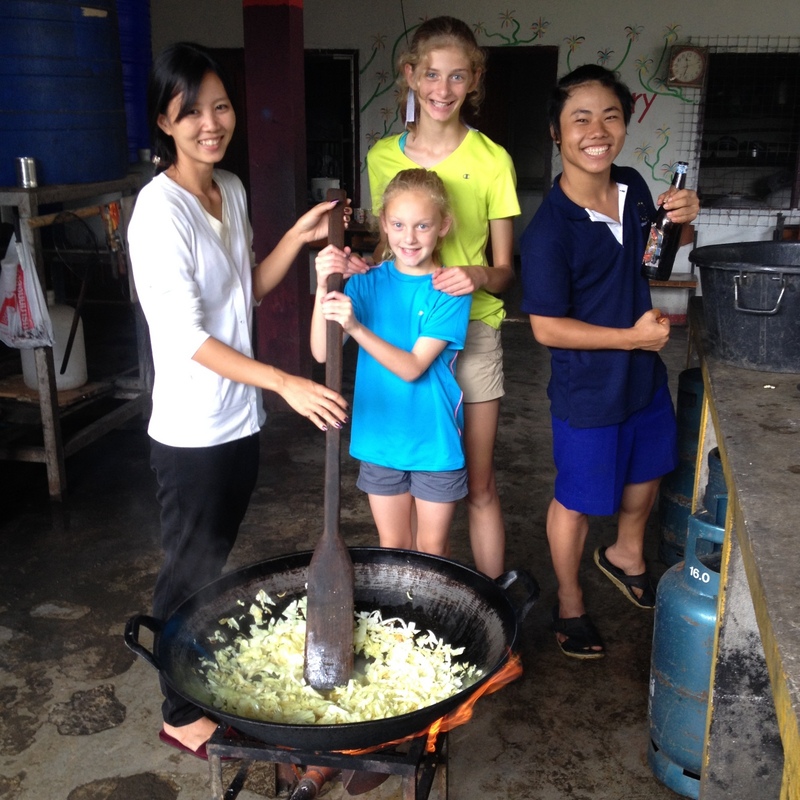 At a secondary learning center (essentially high school) for Burmese migrant students, my nieces helped prepare the afternoon meal: a big wok full of fried rice cooked over a gas fire. 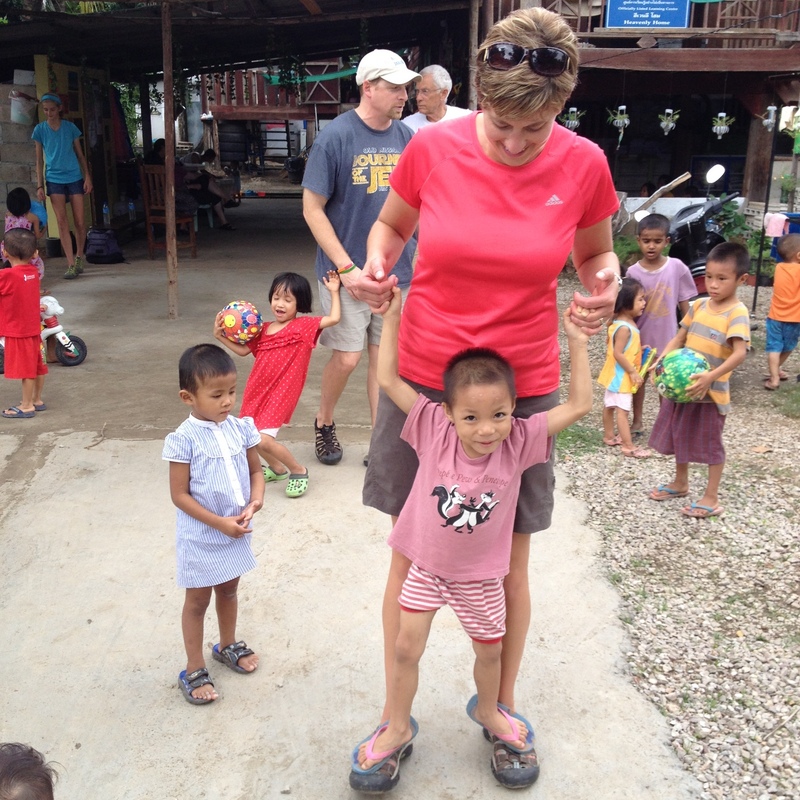 Stopping at the orphanage where I’ve previously visited, my family quickly started interacting with the approximately 80 children who are there. 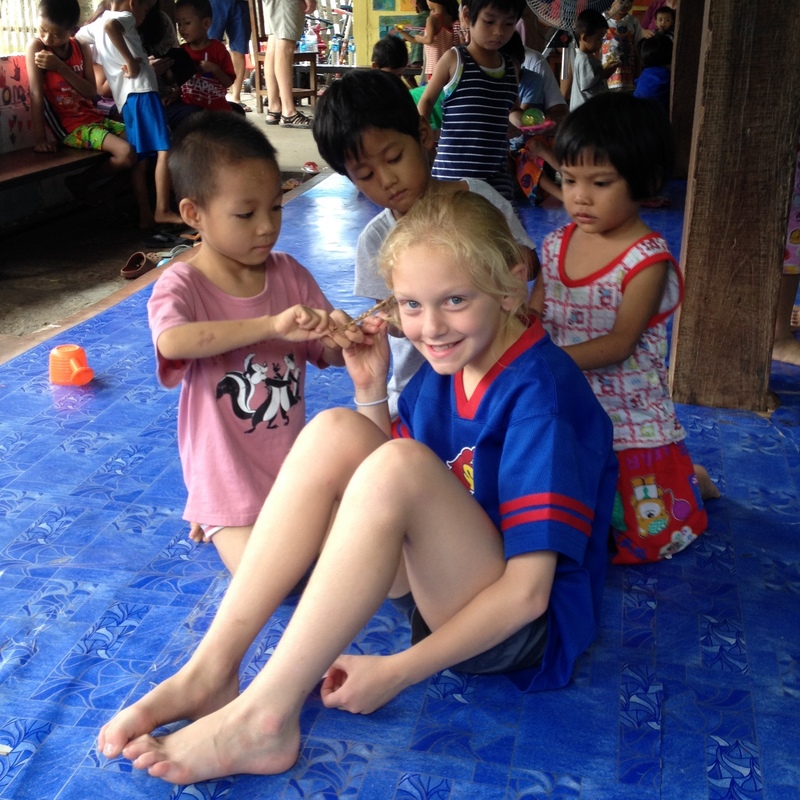 There is nothing these children seem to cherish more than love and attention. My dad sat on the floor and had a queue of children waiting to sit on his lap. 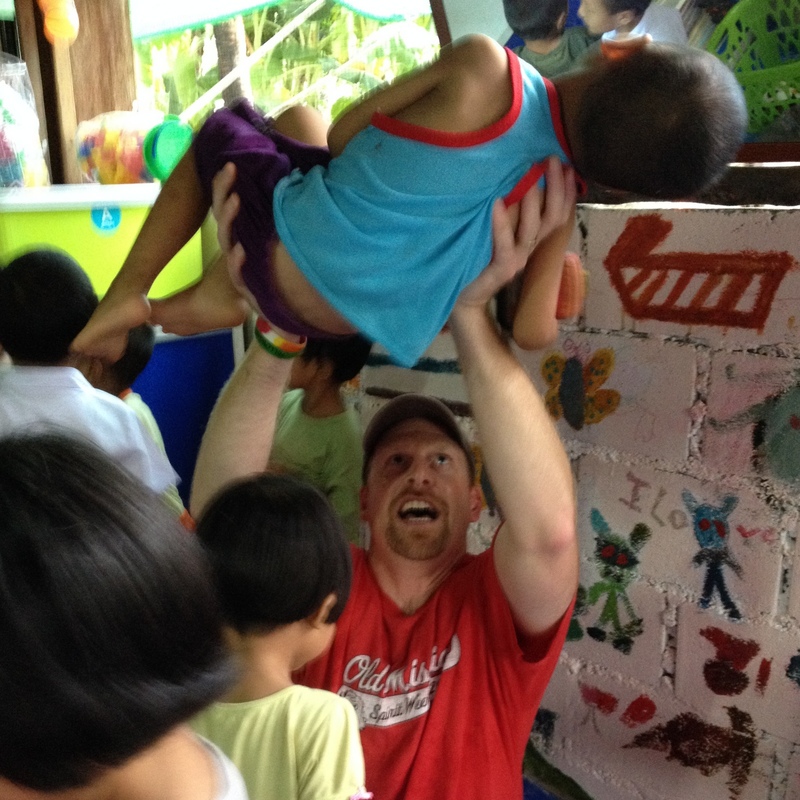 My brother-in-law, who had missed his regular workouts, used some of the younger children to catch up on his weight-lifting. The first day we visited was my sister’s birthday, so we brought cake for everyone and they sang her “Happy Birthday”. Afterwards, many children kept coming up and saying “Happy birthday!” and pretending to make cake for everyone. 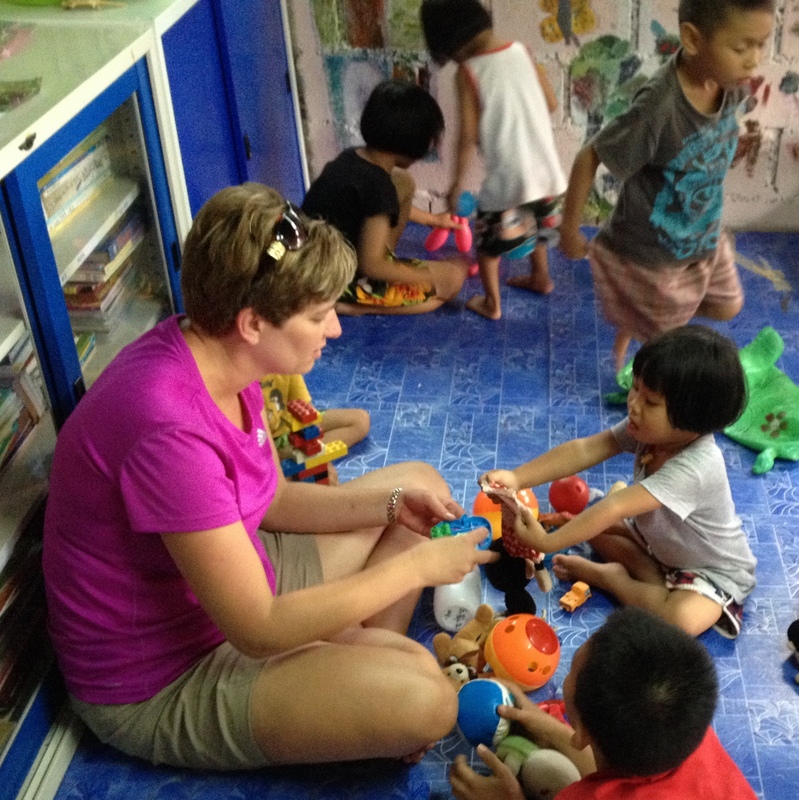 The following day we traipsed through muddy rice paddies to visit a four-day-a-week day care center run by the same orphanage. 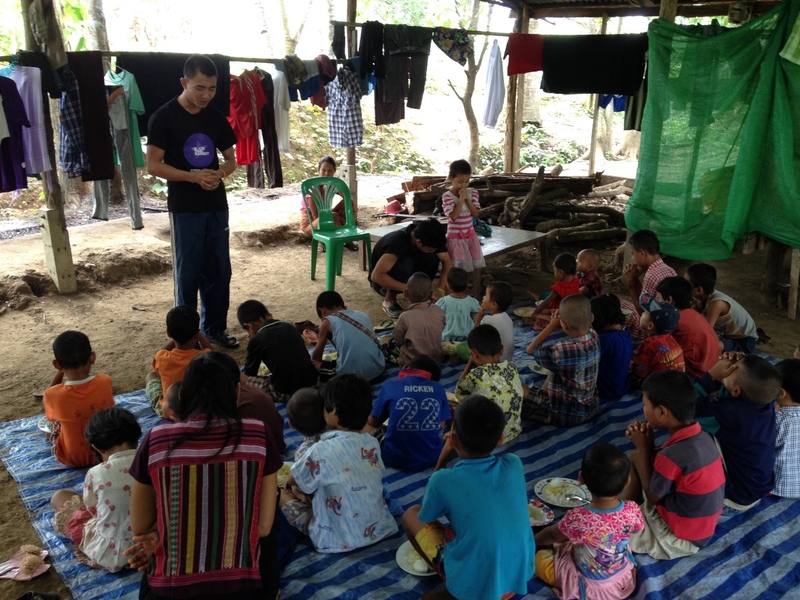 It provides some education and a free meal for the children of migrant workers from the surrounding fields. 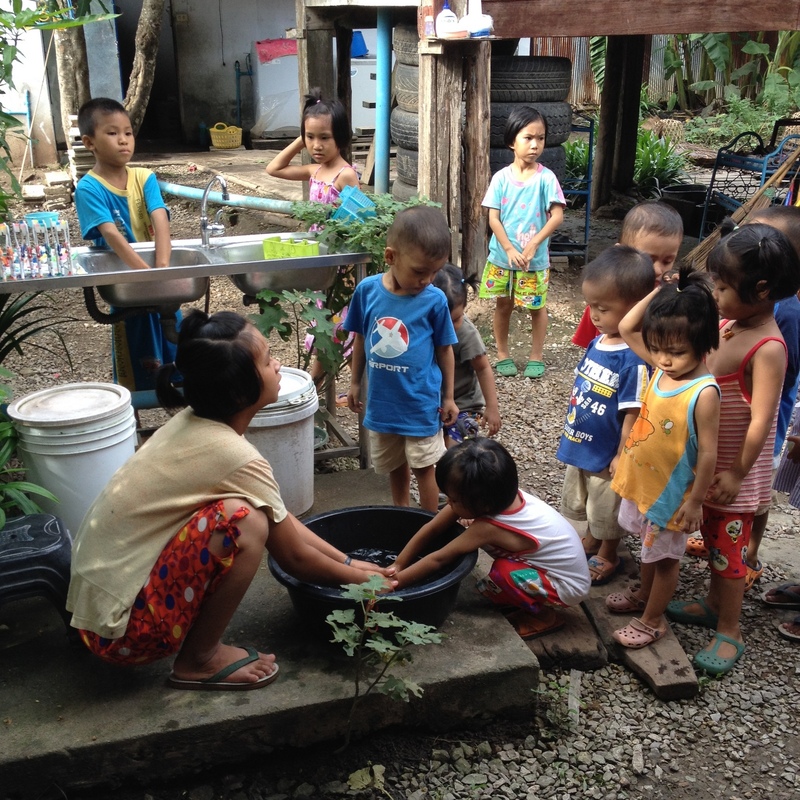 One of the volunteer coworkers leads the children in a prayer before they eat their mid-day meal. For many of the children, this will be their only complete meal of the day. 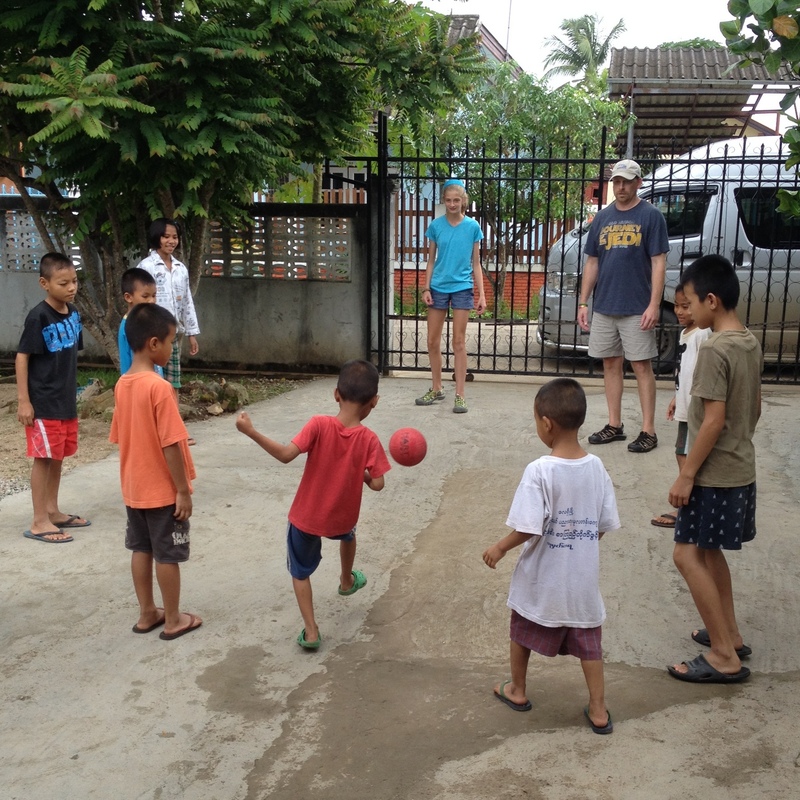 Later in the day we were back at the orphanage, where my eldest niece started kicking the ball around with several of the children. Football (soccer) is very popular here. Several of the girls, all of whom wear their hair very short, were captivated by my younger niece’s long locks and proceeded to braid them in all sorts of creative ways. My mother was spending time with one little girl who seemed like she needed some extra attention. When I was feeding her the day before, she cried every time I tried to pass the spoon off to someone else. 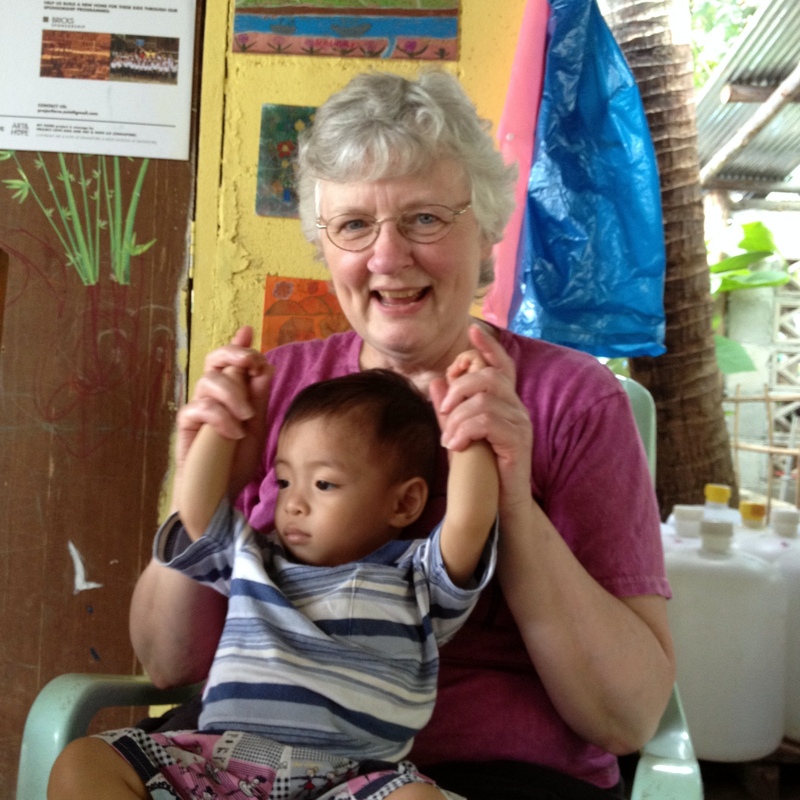 There is one young boy who is both blind and suffers from polio. 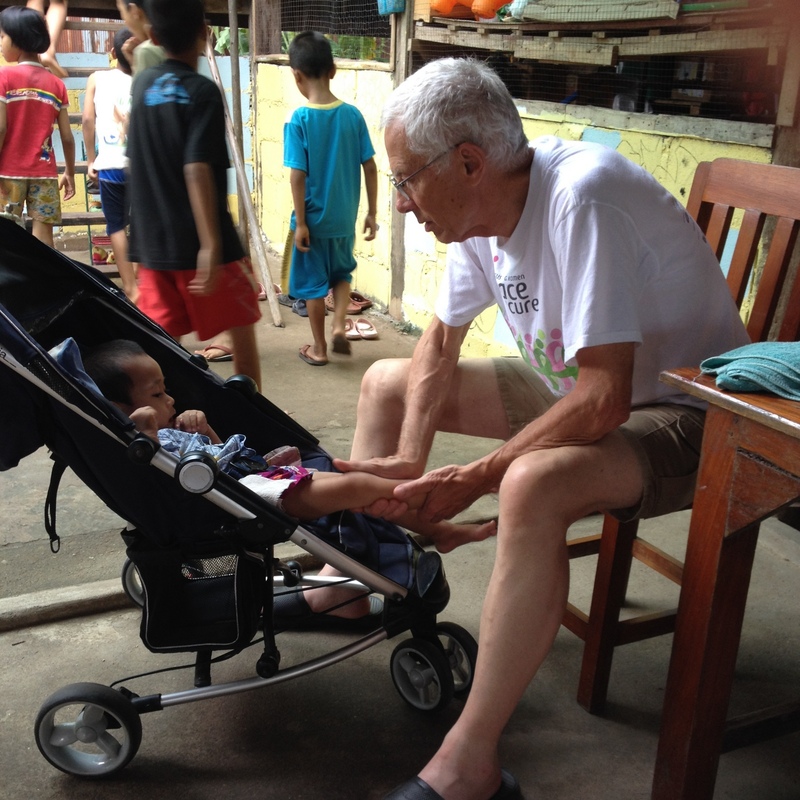 My father spend a while massaging his legs, trying to stretch and strengthen the muscles. The new craze we introduced was walking on the visiting adults’ shoes. I don’t know why this was so popular, but we were followed by a queue of children waiting for a ride. 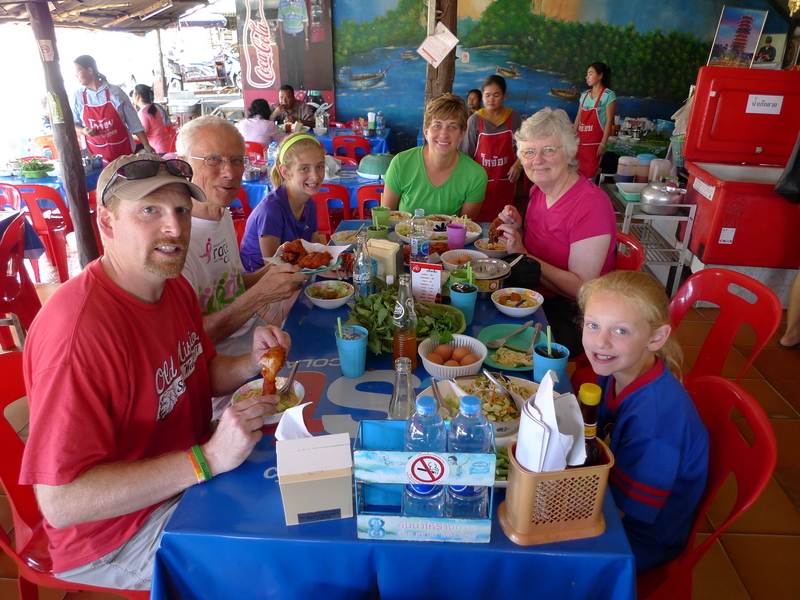 As it neared dinner time, everyone began to wash up for the evening meal and we took our opportunity to leave for the airport and our flight home. The winner of the unintentionally ironic t-shirt contest. 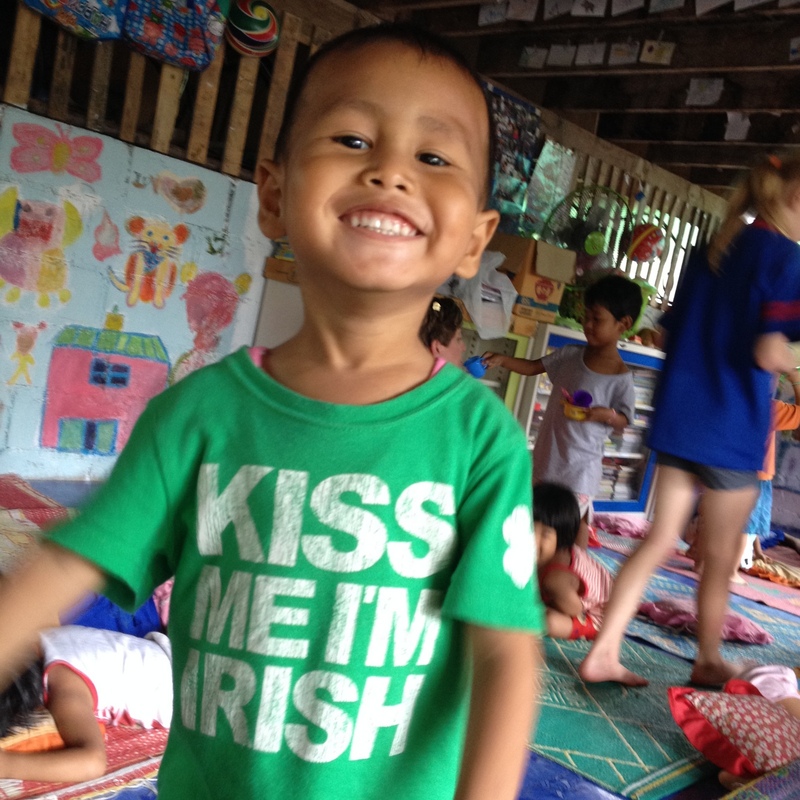 I want to go buy a bunch of funny t-shirts and donate them to the orphanage. It is just too cute when they wear something like this. If you are interested, here is a short video I shot up in Mae Sot when I was there over Christmas with a group of Singaporean volunteers. 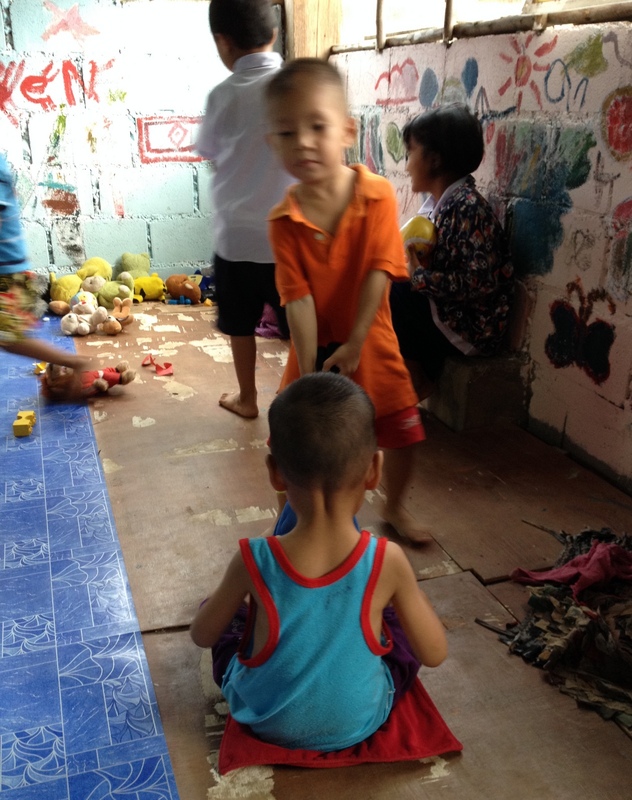 It shows some of the work we did at the day care center to bring a bit of holiday spirit to them.